Resources are the building block of a Deployd app. They provide a way to handle http requests at a root url. They must implement a handle(ctx, next) method that either handles a request or calls next() to give the request back to the router. Resources can also be attributed with meta-data to allow the dashboard to dynamically render an editor gui for configuring a resource instance. A Resource can execute Scripts during the handling of an http request when certain events occur. This allows users of the resource to inject logic during specific events during an http request without having to extend the resource or create their own. For example, the Collection resource executes the get.js event script when it retrieves each object from its store. If a get.js file exists in the instance folder of a resource (eg. /my-project/resources/my-collection/get.js), it will be pulled in by the resource and exposed as myResource.scripts.get. A Resource inherits from EventEmitter. The following events are available. The following resource would respond with a file at the url /my-file.html. Certain methods on a Resource prototype are called by the runtime. Their default behavior should be overridden to define an inherited Resources behavior. Handle an incoming request. This gets called by the router. The resource can either handle this context and call ctx.done(err, obj) with an error or result JSON object, or call next() to give the context back to the router. If a resource calls next() the router might find another match for the request, or respond with a 404. The http context created by the Router. This provides an abstraction between the actual request and response. A Resource should call ctx.done or pipe to ctx.res if it can handle a request. Otherwise it should call next(). Load any dependencies and call fn(err) with any errors that occur. This is automatically called by the runtime to support asynchronous construction of a resource (such as loading files). Note: If this method is overridden, the super method must be called to support loading of the MyResource.events array. If true, ensures that this resource is included in dpd.js. The instance configuration object; used to access the resource's configuration from member functions. Here is an example of a simple resource that exposes a method on the external prototype. When the hello() method is called, a context does not need to be provided as the dpd object is built with a context. A callback may be provided which will be executed with results of fn(err, result). If a Resource constructor includes an array of events, it will try to load the scripts in its instance folder (eg. /my-project/resources/my-resource/get.js) using resource.loadScripts(eventNames, fn). This will be available to each instance of this resource as this.events. The resource type's name as it appears in the dashboard. If this is not set, it will appear with its constructor name. The default path suggested to users creating a resource. If this is not set, it will use the constructor's name in lowercase. Set this property to an object to create a custom configuration page for your resource type. settings - An array of objects describing which properties to display. type - The type of control to edit this property. Allowed types are text, textarea, number, and checkbox. description (Optional) - Explanatory text to appear below the field. 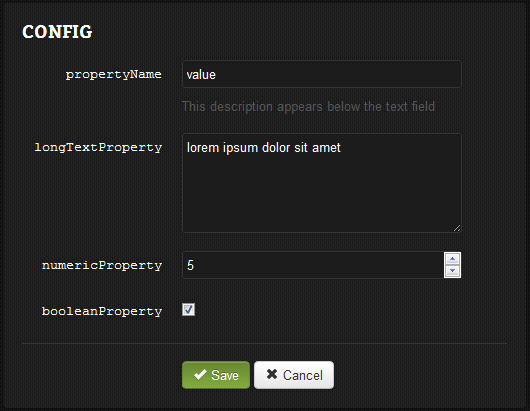 description: "This description appears below the text field"
A resource can describe the dependencies of a fully custom dashboard editor UI. This will be passed to the dashboard during rendering to create a custom UI. An array of pages to appear in the sidebar. If this is not provided, the only page available will be "Config" (and "Events", if MyResource.events is set). The dashboard will load content from [current-page].html and js/[current-page].js. Note: The "Config" page will load from index.html and js/index.js. The default page is index; the config page will also redirect to index. The config or index page will load the basic dashboard if no index.html file is provided. The events page will load the default event editor if no events.html file is provided. For styling, the dashboard uses a re-skinned version of Twitter Bootstrap 2.0.2. Other docs in "Internal API Reference"